Journalist Daphne Caruana Galizia was killed this afternoon in a powerful car bomb blast that left her vehicle in several pieces in Bidnija. 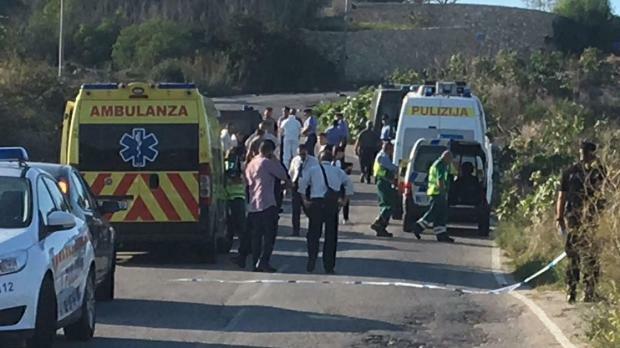 The powerful explosion rocked Triq il-Bidnija at around 3pm and left debris from the Peugeot 108 car strewn across the road and in a nearby field, just a short distance away from Ms Caruana Galizia's home. 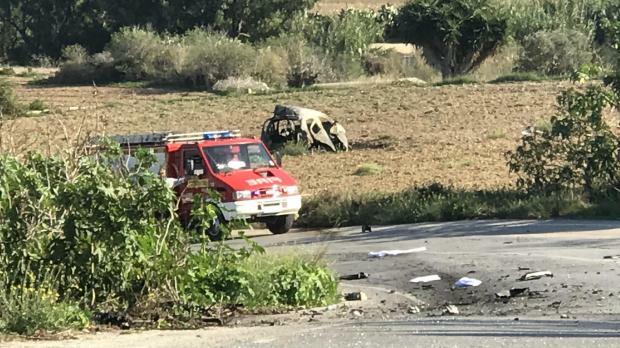 Police said the body, which they declined to confirm as belonging to Ms Caruana Galizia, was blasted out of the car with the explosion's force. 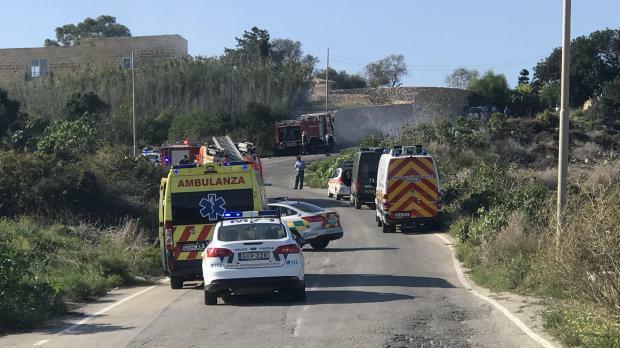 One of Ms Caruana Galizia's three sons was reportedly among the first to arrive at the scene, having rushed out of the family home after hearing an explosion. Family members, including Ms Caruana Galizia's husband, sons and siblings arrived shortly afterwards. According to TVM, Ms Caruana Galizia - an outspoken journalist who had no qualms about writing critically of her subjects - had filed a police report 15 days ago saying she was being threatened. 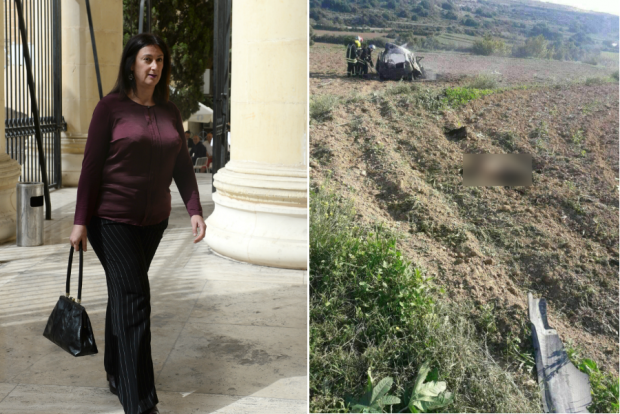 Journalist Daphne Caruana Galizia (left) and firefighters surveying the car wreck in Bidnija this afternoon (right). Forensics teams, Civil Protection Department firefighters, explosive ordnance disposal experts and several police investigators were sent to sweep the scene. Duty magistrate Consuelo Scerri Herrera was also spotted at the site. Her role as head of the magisterial inquiry into the murder is being challenged by the Caruana Galizia family, who have highlighted the bad blood between the magistrate and the deceased Ms Caruana Galizia. New of Ms Caruana Galizia's murder spread across the globe. Prime Minister Joseph Muscat and Opposition Leader Adrian Delia both held press conferences following the explosion (see below) with the two men later meeting at parliament in Valletta. In a statement, the government said both sides had agreed to keep the meeting agenda confidential. Dr Muscat was accompanied by Deputy Prime Minister Chris Fearne, Home Affairs Minister Michael Farrugia and Justice Minister Owen Bonnici. Dr Delia's delegation was made up of his predecessor Simon Busuttil and outgoing PN deputy leaders Mario de Marco and Beppe Fenech Adami. The Opposition Leader's response to last week's Budget 2018, scheduled for this evening, was postponed following the killing. A candelight vigil to express solidarity with Ms Caruana Galizia's family drew thousands to Sliema in the evening, with many Maltese in London also attending a similar event outside Malta's High Commission in Mayfair. Malta has been rocked by a series of unsolved car bombing in recent years. Most are believed to be the work of rival criminal gangs, with no known political motive. 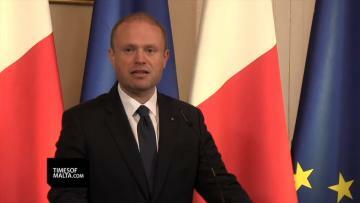 Prime Minister Joseph Muscat held a press conference around 90 minutes after the explosion, in which he condemned the "barbaric attack". "Everyone knows Ms Caruana Galizia was a harsh critic of mine, both politically and personally, but nobody can justify this barbaric act in any way," he said. Dr Muscat said he had asked police to reach out to other countries' security services to try to root out the perpetrators. Speaking in parliament later in the evening, he said the government had asked the US government to provide FBI agents to help local investigators with their work. "I will not rest before justice is done," the Prime Minister said. In a press conference held at around 6pm, Nationalist Party leader Adrian Delia condemned what he called "the worst political killing since that of Raymond Caruana." Dr Delia said nothing would remain the same in Malta after the despicable murder. “This is the darkest day in Maltese politics,” he said, calling the murder "the direct consequence of the total collapse of rule of law in our country." He insisted that any inquiry into Ms Caruana Galizia's murder had to be truly independent, and not led by people such as the police commissioner, commander of the Armed Forces or magistrate Scerri Herrera - who had all been the target of Ms Caruana Galizia's criticism in recent years. President Marie-Louise Coleiro Preca expressed solidarity with Ms Caruana Galizia's sons and husband and appealed for calm. "In these moments, when the country is shocked by such a vicious attack, I call on everyone to measure their words, to not pass judgement and to show solidarity," she said. Calling for bravery and strength in the face of this attack, the Archbishop insisted that being intimidated by this attack would ultimately give in to the murderers’ wishes. Archbishop Sultana phoned in on RTK to offer his condolences, saying that his aim was not to canonise blogger Daphne Caruana Galizia. She sought to speak the truth, not to be sanctified, the Archbishop said. He insisted that politicians need to continue to be held accountable and that this attack is ultimately an attack on the common good. In a statement, the Institute of Maltese Journalists said this was a dark day for democracy in Malta and urged police to bring perpetrators to justice. It urged journalists to not be cowed by the attack and to continue to report on all that was in the public interest "without fear or favour". A group of NGOs including the Malta Gay Rights Movement, aditus foundation, Integra Foundation, The Critical Institute and Platform for Human Rights Organisations in Malta expressed their concern "at the threat to freedom of speech that [Ms Caruana Galizia's] violent murder poses." The NGOs called for an independent inquiry to look into whether police "took the requisite measures" to protect her and whether her violent demise could have been avoided. Ms Caruana Galizia had filed a report about being threatened two weeks ago, public broadcaster TVM reported.